Organic fertilizers contain natural, vital trace elements , minerals, vitamins and other nutrients essential for growing healthy vegetables, fruit, flowers, house plants and shrubs. Give your garden a boost with organic fertilizers. A perfect, all-natural nutrient source, organic worm castings create wonderful soil structure and add beneficial biology to the root zone. They retain moisture in the soil, help to rejuvenate houseplants, and offer new plants, vegetables and flowers a head start when blended into the soil during planting indoors and out. Worm castings are earth’s greatest organic fertilizer. An organic liquid seaweed extract that has been condensed to a level many times more concentrated than other seaweed extracts. Dilute with water (1 teaspoons per gallon of water) and use as a foliar spray, root dip or soil drench. Provides minerals, nutrients and plant hormones that reduce plant stress from weather, insect and fungal attack and/or herbacide burn Seaweed Meal is a pure dried ground seaweed. It is a soil conditioner and should be worked into the soil. As the granules breakdown, they will return depleted minerals to the soil. Seaweed Meal will feed and stimulate helpful organisms that digest organic material and improve the quality and texture of the soil. As the micronutrients become available to the plant roots, they will improve the overall plant metabolism and stiffen resistance to disease and pest damage. 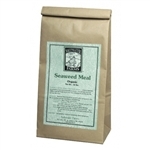 Seaweed Meal is applied in the spring and fall or at the time of re-potting or transplanting at a rate of 1 lb. per 100 sq.ft. *This is a 26 Ounce Shake Can, not a bag as pictured. Made with lobster, crab, fish and kelp meal plus worm castings and other important natural ingredients, this exceptional fertilizer will give vegetable gardens a high calorie energy boost. It is also high in calcium (6%) to help boost plant vigor and immunity. Excellent for vegetables, flowers, shrubs and plants. This certified organic fertilizer comes from Maine. 4 pound bag. Organic liquid seaweed blended with fish solubles. Plant growth hormones found in the seaweed are more effective when combined with nutrients found in the fish solubles. Concentrate to be mixed with water. A few spoonfuls per gallon. Lasts a long time. Dilute with water. Liquid Seaweed improves growth, increases yields and results in healthier more productive plants. Approved by Maine Organic Farmers and Gardeners Association for use in certified organic crop production. Sea Blend is a blend of powerful microorganisms, seaweed meal, granular humate and rock potash. Sea Blend conditions the soil, breaking down organic matter, supplying humate and the binding properties of potash. This allows nutrients to be readily absorbed by plants. 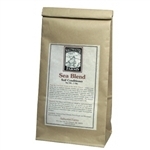 Sea Blend is applied in the spring and fall or at the time of repotting or transplanting at a rate of 1 lb. per 100 sq.ft. Dilute with water. Liquid Seaweed improves growth, increases yields and results in healthier more productive plants. Approved by Maine Organic Farmers and Gardeners Association for use in certified organic crop production. Liquid seaweed blended with fish solubles. Plant growth hormones found in the seaweed are more effective when combined with nutrients found in the fish solubles.